Cambridgeshire County Council Pension Fund invested more than £90m in fracking companies through pooled funds in 2016 to 2017, a new study by environmentalist organisations has claimed. The study, “Divest Fracking - how UK Councils are Banking on Dirty Gas”, was published yesterday by 350.org, an environmentalist grassroots organisation, and was written in collaboration with Platform London and Friends of the Earth, two campaign groups which advocate against fracking and fossil fuel use. The study further estimated that UK local councils invested more than £9 billion in total in fracking companies, whose practice of extracting oil and gas from shale rock has been criticised for requiring significant amounts of water and for polluting groundwater near fracking sites. As Cambridgeshire County Council did not have any direct investments in fracking companies, researchers for the 350.org study estimated the proportion of the fund’s indirect, bundled investments which included fracking companies. The study analysed the fund’s top 15 indirect investments, and applied its estimate for fracking investments in the pooled funds identified. The £90m figure for the Cambridgeshire County Council Pension Fund, which would account for 4% of the fund’s total investments, has sparked backlash from local environmental groups, including the Cambridge Zero Carbon Society, which has played a central role in climate activism in Cambridge over the past year. A spokesperson for the County Council dismissed the estimate, saying that they “don't recognise the figure quoted as a current investment by our Pension Fund”, adding that “early feedback indicates a limited exposure to energy companies”. The study based its figures on the estimated composition of pooled investments, as it would have been near-impossible to ascertain the exact exposure of the Council’s indirect investments in the industry – the specific breakdown of each fund’s shareholding was not available to researchers to be analysed. Sheena Mooney, a representative of campaign group Fossil Free Cambridgeshire, said she is “sure the vast majority of Cambridgeshire citizens will not be happy to find out they are funding the fracking industry”. She added that no one “wants to bet their pension savings on a dangerous industry that is completely unnecessary in the face of the spiralling climate crisis”. Local environmental campaign groups, including Fossil Free Cambridge and Cambridge Zero Carbon, organised a rally on Saturday 8th September to demand for urgent political action on climate change. 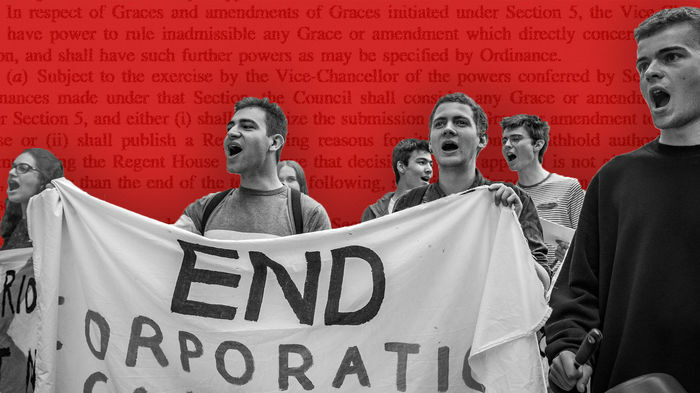 Analysis Council’s divestment decision has been formally challenged – can it evade scrutiny? Yesterday’s report comes weeks after the government revealed a controversial proposal to fast-track the fracking process, bypassing local consultation. This is another issue that protesters plan to raise at the upcoming rally. Environmental activists have organised multiple large-scale demonstrations and protests in Cambridge over the past few years. The University’s reluctance this year to commit to full divestment of its endowment from fossil fuels was met with multiple protests of several hundred students and staff, as well as a 7-day occupation of Greenwich House, a University administrative building, and a 6-day hunger strike by Zero Carbon members. Cambridge’s University Council voted against a commitment to full divestment in June, going against a three-year campaign by Cambridge Zero Carbon and national calls for divestment.